How did the gods at the beginning of creation get out of their fix and allow the magnificent universe to be created? They were churning the cosmic ocean of milk with a giant snake which was wrapped around a mountain. But the mountain began to sink. 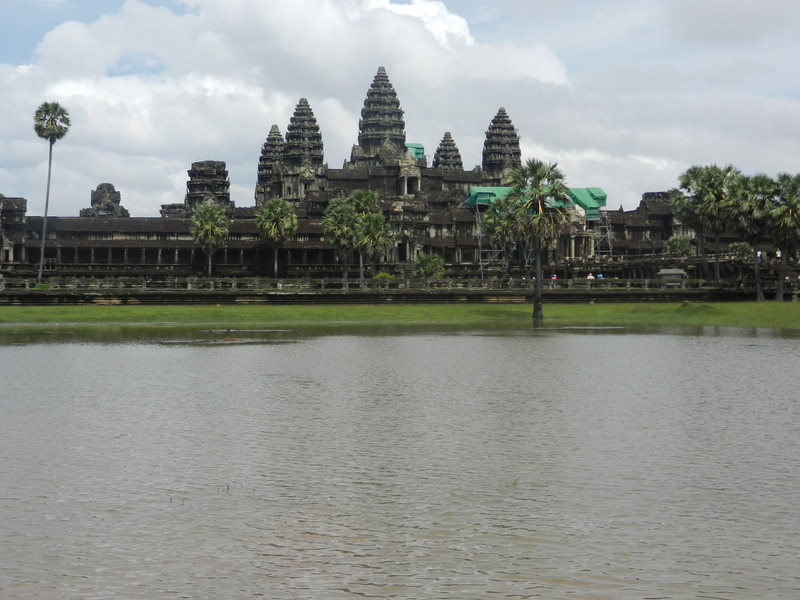 From that mess to the glories of Angkor Wat–how did it happen? Vishnu to the rescue! He incarnated as a tortise to support the pivoting mountain on his back. He’s a very robust-looking tortoise above. 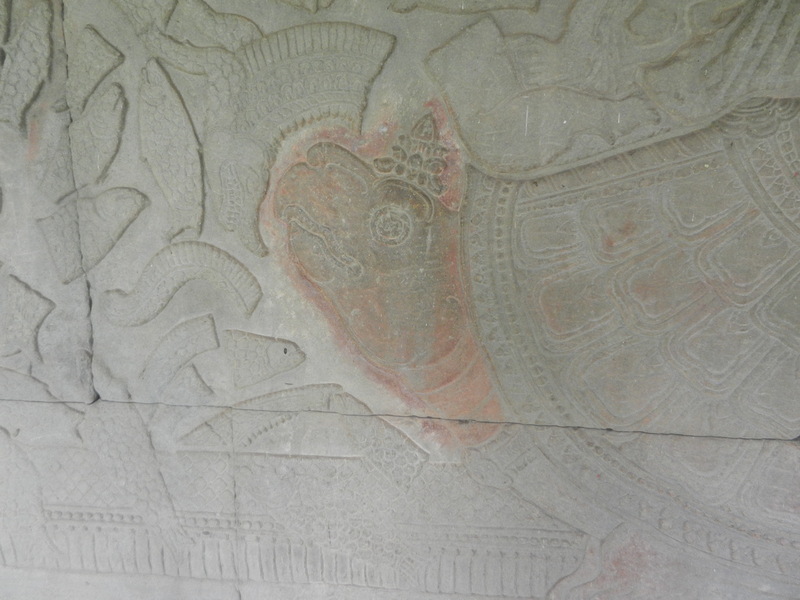 But the last post on Angkor Wat’s Genesis showed Vishnu incarnated as a dapper young man. 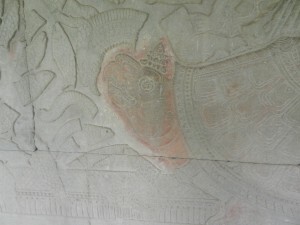 In the above photo, the humanized Vishnu is over the tortoise’s back (which you can see at the bottom), and against the mountain. 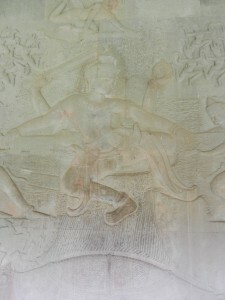 He has 4 arms and holds a club and a discus–an Indian iconographic tradition that was already old when Angkor Wat was built. Now THAT’S a male ego! 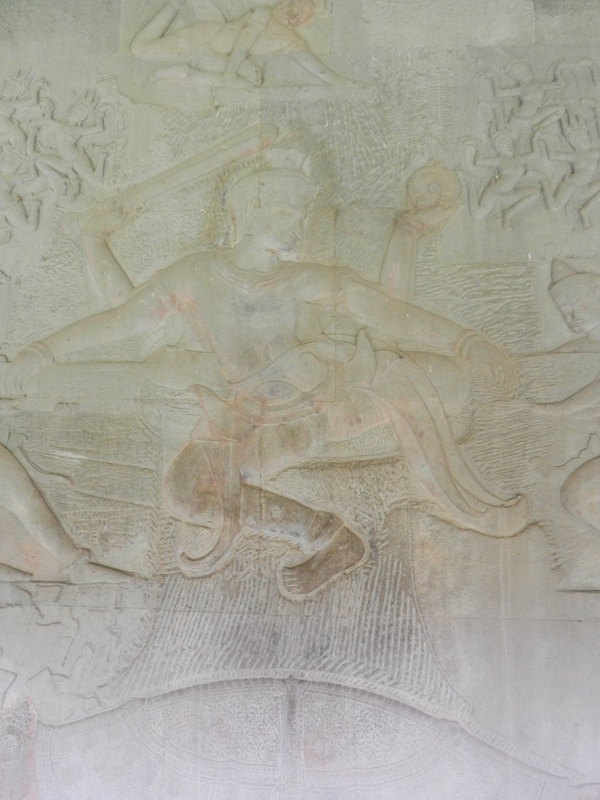 “If I were any better, I’d be twins.” But if Angkor Wat’s builder, Suryavarman II, did identify himself with Vishnu, he could replicate himself into many of Vishnu’s incarnations. 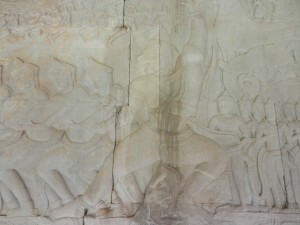 Images of Rama and Krishna also empower Angkor Wat’s walls. The king even took liberties with the Indian texts. 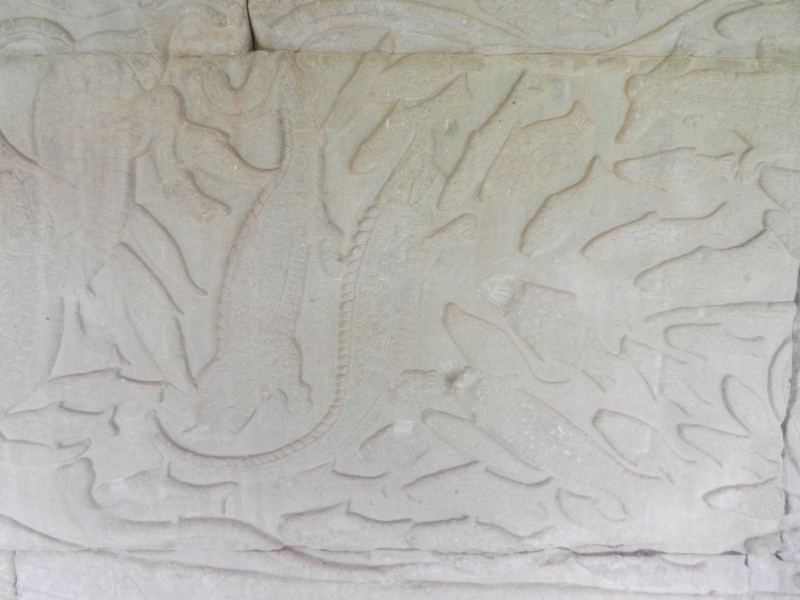 Above, a character from the Ramayana, Sugriva (in the form of a monkey), pulls one end of the snake. But the original Vedic creation myth didn’t have anyone from the Ramayana. Vishnu incarnated as Rama in the latter text. Khmers were thus blending Indian stories to fit their own view of the world, which included multiple Vishnus at the same time. The above frieze makes the power of the churning of the ocean clear. Fish and crocodiles near the tortoise are caught in a whirl of energy. 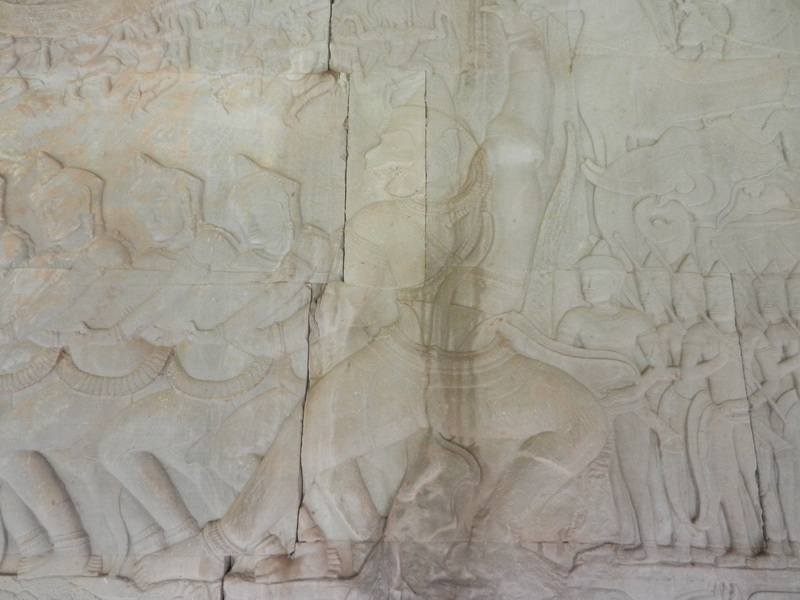 Khmers loved action scenes that matched the power of the king and the monsoons. 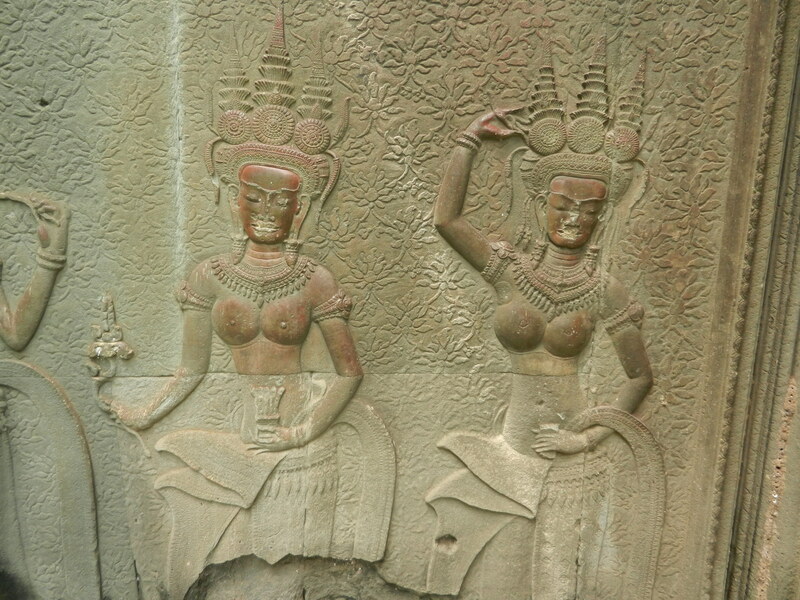 But above the 2 Vishnus, celestial dancers called apsaras celebrate. They also emerged from the churning, and their celestial grace balances the dynamo beneath. Khmers created many grand panoramas like this on their temple friezes. Indian myths about a vast cosmos of multiple divine incarnations and temporal periods fit their kings’ self expressions. The rulers blended ideas of a huge universe with images of the gods’ power, and projected themselves as central figures. Creation in Genesis is set–Yahweh created the universe in six days. But India has had several myths about creation and past eras. Khmers blended them to envision a vast cosmos full of awesome power which the king could identify with–as though he wanted to cover all bases to run the empire. 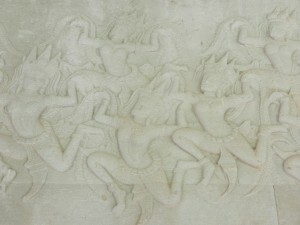 But the Khmer genius balanced these grand epic visions with standards of grace that have never been surpassed anywhere–more than 2,000 apsaras sway on Angkor Wat’s walls. 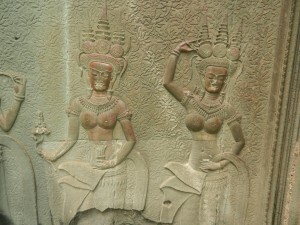 Angkor Wat’s form blends power and grace too. It’s massive enough to command the earth, but its towers are so well balanced with each other that they seem to float in the heavens. Genesis according to Angkor Wat created a very full universe, which will always captivate travelers. Banteay Srei is another Khmer temple that balances both perfectly.